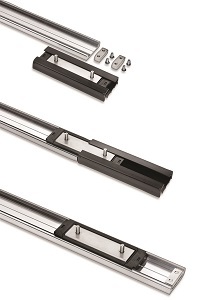 Santa Fe Springs, CA - Accuride announces the introduction of the 115RC Linear Motion Track System, sliding hardware designed to provide guidance, movement, and positioning for screens, panels, partitions, or other components in industrial, commercial, or institutional applications. The system is comprised of two primary components: lightweight aluminum tracks and re-circulating ball carriages. The track is available in lengths of 47" and 94". These lengths may be cut down to smaller spans or butted together to produce greater lengths, virtually without limit. The track may be side, flat, or vertically mounted. When flat mounted, the track may be oriented with the ball carriage facing up or down. Vertical mounting is used to provide guidance in non load-bearing applications. The recirculating ball carriages are available with stainless steel or polymer ball bearings. The stainless steel option provides a higher load rating, while the polymer ball bearing carriage is grease-less and operates more quietly. The ball carriages are about 4.3" in length and have two threaded studs that provide the means to attach components. Carriages may be used singly to provide independent movement of lighter elements or multiple carriages may be combined as a unit to carry bulky or heavy items. Additionally, both methods may be used within one track. The 115RC system carries a maximum of 265 pounds. Load capacity is based on the type and number of carriages inserted into the track. The 115RC System is easy to install. The tracks have drilling marks to locate the fixing holes and end stops. Once the track is installed and the ball carriages are inserted, end stops are added to keep carriages securely within the track.